Great cast, well written characters, amazing action sequences. Some characters are wasted by their untimely deaths. Fantastic from the opening sequence to the final credits. It’s been years since Daredevil, the movie, came out. Back then Marvel didn’t own the rights to its character and not many fans of Matt Murdock were happy with how the movie unfolded. I can’t say I was happy either and the whole experience made me a little wary of the potential of a new Daredevil experience. But I sure am glad I didn’t falter under the pressure of my own prejudice! Netflix and Marvel have teamed up to bring us a new TV show featuring the one, the only: Daredevil! While being an origin story, at least for season 1 (fingers crossed for another season), the show doesn’t feel like it’s dragging its feet, throwing backstory at us in a heavy-handed manner, as it’s usually the case. Each little piece of the puzzle adds to the greater picture and, at the end, I doubt anyone could feel disappointed. Since we get to learn most everything about Matt Murdock’s past, even new fans of the character can enjoy him, something that will most definitely help with the way the show is seen and received by the public. The spotlight is shared between the “heroes” or the “good guys” and those of (at least initially) grey morality. I’m looking at you, Wilson Fisk. This only serves to create a string of multi-layered characters, instead of the caricatures of good and evil that are generally hurtled at us by authors, regardless of the medium. The one thing that is repeated in various forms throughout the series is that everyone has the potential to go too far (I’ll leave you to guess towards which side I mean) while trying to do the right thing. Daredevil is the one seen dancing on the edge of the abyss, always one step too close to becoming what he fights against, his belonging to the good guy group being questioned repeatedly by those closest to him. A nice touch, at least in my opinion, considering that he’s essentially a vigilante and most of us wouldn’t react kindly to having someone wearing a mask passing judgement on our actions based on rules we aren’t familiar with, but forced to obey or else. Daredevil is well acted, well written, well directed, with amazing action sequences that don’t leave the heroes or the villains getting up without a scratch the next day, what can I say? I hardly have any complains about the show. And there is one thing that brought more realism to it. It might seem small and possibly inconsequential to most of you, but the people that aren’t native English speakers don’t speak accented English while surrounded by no one other than their own family/friends/mooks. I gave the show a huge thumbs up for that alone. But since things can only strive to reach perfection and never attain it, there are some things I have to question about Marvel’s Daredevil. The waste of perfectly great characters. Claire Temple (Rosario Dawson) is relegated to being a secondary/tertiary? character, given less development than Wesley’s loyal dog Francis. I might be exaggerating on that one, only slightly, but since I wanted to see more of her, can you fault me? Ben Urich(Vondie Curtis Hall) is another character that I felt deserved better. While pulling an almost Game of Thrones like move on us he becomes nothing more than the proof that everyone can die, never quite reaching that potential that is mentioned several times over, but never proven to us. He’s not the only one in that situation either. Charlie Cox plays Matt Murdock and he does quite a fantastic job of it. From showing Matt’s sensible side to mowing down Russian Mobsters as Daredevil, he hardly ever misses a beat. I can’t say I was too familiar with his work prior to Daredevil, but I am glad he got the part, because he puts other actors, that shall not be named, who have also played the part, to shame. 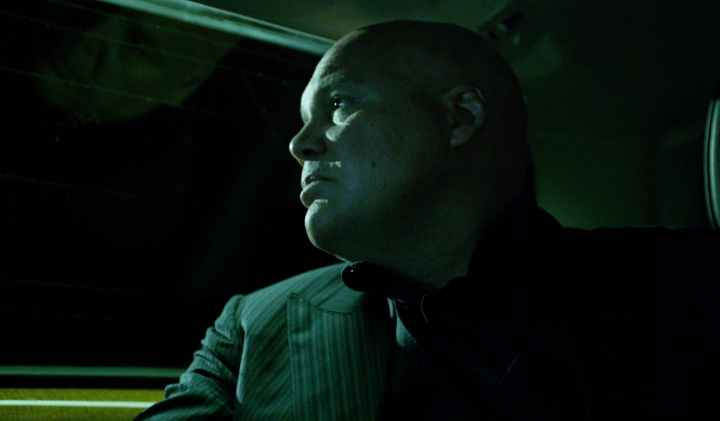 Vincent D’Onofrio as the unhinged Wilson Fisk, who slowly devolves from someone dreaming to save the city to a man accepting his fate as the cancer meant to destroy it, is also someone deserving of praise. I always loved his work and I am happy to see him in this role that seems to fit him like a glove. The two of them, pegged against each other make the entire show worth watching. It’s like Wizard’s chess where if you make the wrong move you get horribly knocked down. (Honourable mention to the one less realistic aspect of the show: apparently no one there gets a concussion, no matter how horrible the blow to the head he/she sustains). 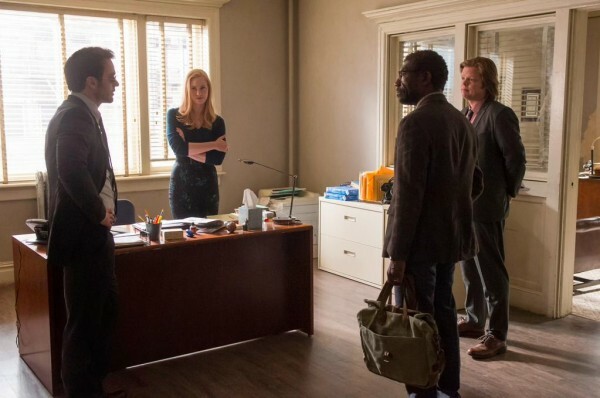 Karen Page, Foggy Nelson, Ben Urich, James Wesley and Vanessa Marianna could’ve become nothing more than satellites to the two characters involved in the “great battle”, but a great combination of good acting and good writing makes sure that they each get their own moments in the spotlight and that they are all developed. We don’t forget that they exist if they are missing for more than five minutes, which is usually the case with a large cast. Props for that and for the fact that not one character has been pushed to a corner, leaving them with nothing to do while everyone else is getting a piece of the action. Every episode of the show is already available on Netflix, having been released on the 10th of April. Personally I binged watched and now I regret my life choices, since if a new series is to be produced it will take at least a year for new episodes to come out. But it was definitely worth it and I have no regrets. Superheroes and comic book characters are a dime a dozen this days, on TV and in movies alike, but out of the vast majority of shows that came out recently, this one is definitely one of the best. Unlike other attempts from Marvel to break into the world of TV, this is definitely not a failure, having just about everything it needs to achieve what it aimed for: win over new fans, satisfy the old ones and make quality entertainment at the same time. 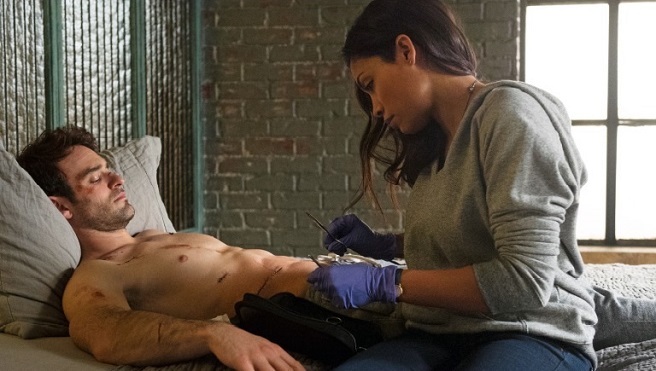 Have a taste of what Daredevil is all about, then start binging yourselves. I promise you won’t regret it. (Unless you actively want that, in which case…I can’t help you). Netflix is also working on making the show accessible for those visually impaired, something that they will do for their other shows as well. Is that great or what? I’ll go with great and leave you with the very first fight scene from Marvel’s Daredevil. Enjoy!